Fall has officially begun, and we're tumbling into it headfirst. What with all the spooky Halloween bath and body treats and fun candy, the Halloween celebration is in full force. As you're no doubt aware, the official flavor of the fall and Halloween season is pumpkin and all things pumpkin spice, so there are tons of products coming out that capitalize on that unique flavor. 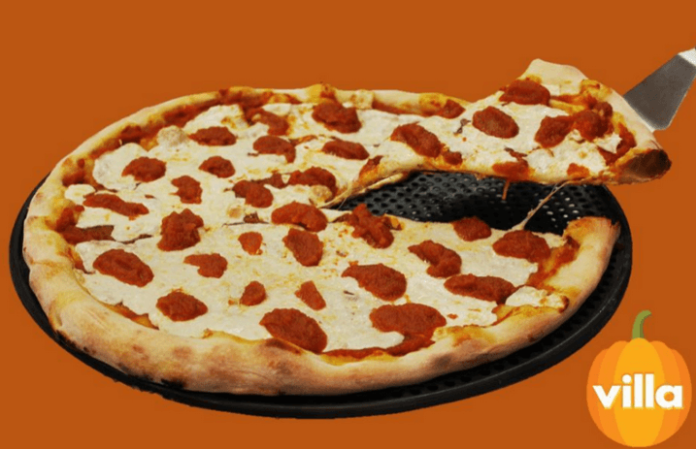 But here's one that may never should have existed: pumpkin spice pizza. Or it could very well be one of the smartest ideas ever produced by man, right up there next to sliced bread. You'll have to taste it to find out. Pizza chain Villa Italian Kitchen is serving a special salty and sweet pizza with savory pumpkin spice sauce with a sauce layer of “pumpkin puree” with nutmeg, clove and cinnamon and tons of delicious cheese featuring the “cozy, seasonal flavors of fall.” That doesn't actually convey how the pizza itself will taste, but it does bring to mind visions of cool fall days with the brisk air blowing around you, kids running around in costumes, and the trees turning red and gold. Not too bad of an image, right? The pizza will be available to entice you and confuse your taste buds all day today, if you're near the chain. You can check out the official Villa Italian Kitchen web site to find a location near you, but you'd better hurry. The pizza is only available today, the first day of fall. Better hurry before the doors close!